Thank You Saint Barth! 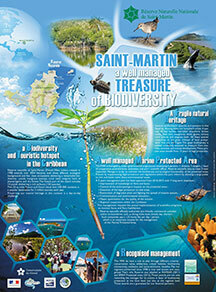 The Réserve Naturelle hosted Karl Questel, a ranger at the Territorial Environmental Agency of Saint Barth, on May 16-29. Renowned for his deep knowledge of tropical flora and fauna, Questel lent a hand to Caroline Fleury in her creation of an inventory of the terrestrial flora and fauna the within the Réserve Naturelle de Saint-Martin. During this two-week project, Fleury and Questel identified every species they encountered, whether native, endemic, introduced, or invasive. Each species now has its own information sheet, which comprises its vernacular (common) name, its scientific name (in Latin), its photo, and description. On the Sentier des Froussards, for example, between Anse Marcel and Cul-de-Sac, 211 floral species and 103 animal species share the landscape, including a large number of insects. Endemic species - present naturally on the island - were given special attention, with an eye toward their preservation, as were invasive species, in terms of controlling them, if not eradicating them entirely. For example, one scaevola taccada flowering shrub was found at Pinel and might be uprooted. Called “sea manioc” in La Réunion, this plant comes from the Indo-Pacific region and tends to invade the coasts of Caribbean islands and Florida, where is supplants its endemic cousin, scaevola plumieri. Fleury and Questel spent one night on Tintamare, in order to identify nocturnal species: starting with insects - butterflies, grasshoppers, ants - as well as other species, such as crabs and birds. 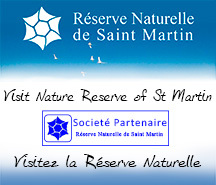 The Réserve Naturelle covered Karl Questel’s stay in Saint Martin, as part of a partnership program between the two islands.